Some time ago, a friend challenged me to explain why the Holy Spirit gave Cornelius the gift of speaking in tongues before he was baptized. 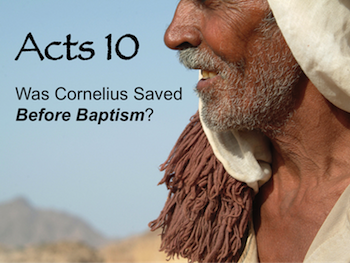 (Acts 10) He was attempting to prove that Divine intervention indicates Cornelius was saved before he was baptized. The following article is my response. Acts 10 seems to be a ready-made passage for those who desperately want to find at least one biblical example which reduces baptism to a post-salvation symbolic act ("an outward sign of an inward grace"). But is it possible that, in their desperation to validate a human bias, they are distracted from the greater responsibility to submit to the whole counsel of God? 3. Why would God introduce such an obvious anomaly into the consistent biblical pattern of assigning miraculous gifts after baptism? Let's look at each of these questions individually, then combine the results in conclusion. It should be noted that Peter insisted on Cornelius and the others being baptized even after the miraculous sign was witnessed by all. Why? If their baptism was only intended to be a formality that showed they were already saved ("an outward sign of an inward grace'), wouldn't baptism seem a little anti-climactic? Perhaps an even bigger question is what would a purely symbolic baptism say about Jesus and His role in that baptism? "In him you were also circumcised with a circumcision not performed by human hands. Your whole self ruled by the flesh was put off when you were circumcised by Christ, having been buried with him in baptism, in which you were also raised with him through your faith in the working of God, who raised him from the dead." In Colossians 2:11-12 the Holy Spirit clearly teaches that baptism is the very point at which Jesus performs the Divine operation called circumcision. It is the very point at which He removes sin from the heart. When baptism is reduced to a level of symbolism, the Surgeon is reduced to the role of a Public Relations Manager. Jesus deserves more! If Cornelius was only being baptized as a post-salvation symbol, one very obvious question needs to be asked - What good did a symbolic baptism accomplish, given the fact that the Holy Spirit had already given such a dramatic validation with the gift of tongues? How could a symbolic baptism possibly top the reality of what the Holy Spirit had already done? Why would they even try to top the outward sign of the Spirit's miraculous intervention? I suggest that the only thing which can top an external miracle done for validation is an internal miracle done for salvation. Cornelius and his friends were baptized for the very same reason that all the folks were baptized on the opening day of the church, "for the remission of sins." (Acts 2:38, NKJV). Their healing (salvation) did not precede their surgery (baptism). In Ephesus, Paul finds several men who were disciples but lacked a proper baptism. It seems that, in their pursuit of Christianity, they had only been immersed into John's baptism, a baptism of repentance. Paul explains that John the Baptist's baptism lost its purpose once Jesus had come and now they needed to be baptized in the name of Christ. It is interesting to note that, in verse 5, they obeyed Paul's instructions by being baptized in the name of The Lord Jesus. Yet it was later, in verse 6, that they received the Holy Spirit gifts of tongues and prophecy. Q: Why were the two events separated? A: Because a person submits to baptism in order to be saved but the Holy Spirit assigns gifts to a person in order to validate them or their message. One shows Divine employment, the other Divine healing. Is there a difference between salvation and validation? Absolutely! Notice three examples. In Daniel 4:28-37, God employed a pagan king to receive Divinely inspired prophetic messages through dreams. Should we conclude that Nebuchadnezzar was saved at the time of these Divine interventions? If so, then why did God punish the pagan king of Babylon for arrogantly ignoring His message? In spite of direct Divine intervention, Nebuchadnezzar was transformed into a human animal that ate grass like an ox and grew nails like the claws of a bird. Was Nebuchadnezzar saved because God spoke through him? No, God simply gave this grass-grazing ox/king an experience of validation in order to remind him and the world that it is still God Who governs the thrones of men. Since Saul's sins were not removed at the time of the miraculous events, it is safe to assume that Divine intervention does not remove the need for Divine surgery (baptism). It seems obvious that Saul's pre-baptism Divine interventions were not given to indicate salvation but rather to validate Saul and set up Ananias so that he could urge him into the operating room. Is it possible that this is the same reason the Holy Spirit came upon Cornelius and his friends before baptism? The word "anomaly" is used here with great intent. It means "deviation from the regular arrangement, general rule, or usual method." (Webster's Dictionary) Receiving the validation of supernatural gifts before being baptized was a deviation from the usual method. Why did God employ such an attention grabbing measure in this unique situation? Because it was just that - unique. Not since Abraham had the Gentile world been invited into the favor of God. For thousands of years, Gentiles had been looked down upon and rejected. This moment was not just about Cornelius' salvation, it was also about a very important pivotal point in history. God employed dramatic measures because He wanted everyone to know that it was He, not Peter or any other man, Who was validating this historical transition from "Jews Only!" to "Everyone Invited!" In order for that moment to be believed, the invitation required a direct intervention from God. Note: Even if a person were to argue that Cornelius was saved before baptism, and I do not, it would still need to be viewed as the exception to the rule not the rule itself. Immaturity is often marked by a preoccupation with exceptions to the rule or a search for ways to get around the rule. Spiritual maturity, on the other hand, leads the faithful into full surrender to the whole counsel of God. There is a great difference between being employed by God and being saved by Him. In Luke 19:39-40, Jesus said that God could employ rocks to cry out if His Son was not given praise. Few people would conclude that it meant the rocks were saved. In Acts 19:11-12, God employed handkerchiefs as a way to pass along the healing powers of Paul. Few people would conclude that it meant the handkerchiefs were saved. In Numbers 22:28, God employed a donkey to speak a warning to His stubborn prophet Balaam. Few people would conclude that it meant the donkey was saved. In Acts 8:9-17, we find that it is equally possible to be saved yet not be employed by God to do miracles. Conclusion: From rocks and handkerchiefs to a donkey and a pagan Pharaoh, it seems clear that employment by God and salvation by God are not the same thing. The anomaly of Acts 10 should not be used to suggest that salvation comes before baptism. Those who do so expose their own desperation to validate a human bias rather than submitting to the abundance of examples and directives that confirm the saving power of Christ's surgery found within baptism. Back to Top of "Saved Before Baptism?"